Sometimes with this financial stuff, you get bombarded with a bunch of information about what you should be doing. What I don’t see a lot of information about is the first thing you should be doing with your money. I mean the bare minimum. 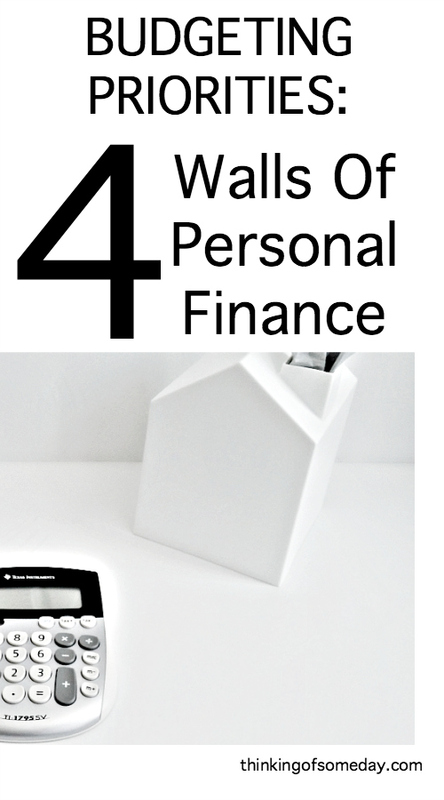 If you find yourself deep in the doo-doo of life then the very first thing you should do with money is take care of your 4 walls of personal finance. For those of you that don’t know, the four walls of personal finance are food/clothing, utilities, shelter, and transportation. These are the minimum things that you need to have in order to survive. Of these four you can own three: food/clothing, transportation, and shelter. Utilities generally aren’t terribly expensive and can be maintained by most families in an emergency. When I was in grade school one of the methods we learned was the order of operations (a.k.a. PEMDAS). The Order of Operations told us how to navigate a complex mathematical expression that had several operators. If you took care of each operator in the sequence that the Order of Operations instructs you’ll always get the right answer. The 4 Walls of Personal Finance are pretty much the same. These are the 4 things, in order, that you should take care of if you get into deep financial trouble and need to keep your head above water. This is the first item you should take care of if you ever get into deep financial trouble. You need to make sure your family has food to eat and clothes to wear. This doesn’t mean steak and Gucci! It means rice porridge and Wal-Mart. It doesn’t matter if collectors are blowing up your phone or knocking on your door. This is the first thing you do with money. Period. This is your water, electric, and/or gas. You’ll need to keep your family cool or warm depending on the season. You need water to drink and to clean yourself. And you’ll need to be able to cook that rice porridge. The third thing you take care of is your shelter. That means paying your mortgage or your rent. You need a roof over your head to protect you from the elements. This will probably be your most expensive thing to pay unless you own your home. And the reason utilities come before shelter is because if you’re in a bind, typically your utilities will be cut off quicker than you will be evicted from your apartment or your home foreclosed on. The last thing you need to pay for if you are in financial trouble is your transportation. Hopefully, you’ve paid your car off and won’t have to make a car payment! If you haven’t this one can be pretty expensive as well. But you’ll need the ability to go to job interviews or to those temporary jobs to hold you over. Of these four walls, transportation and shelter are definitely the most expensive. Take a second and dream with me though. What if you completely owned your car and your home? I mean zero payments to anyone. Would you fear losing your job as much? Would you be living paycheck to paycheck? What if the economy took a dip like in 2008? Would you continue to do a job you hate because you need to make a certain amount of money? On the other hand, think about the cash flow you would have with no car payment and no mortgage payment. How much could you save and invest for your future? How much would you be able to travel? Could you get those hardwood floors in your house you’ve always wanted? How about that complete renovation of your bathroom? How much could you give to people in need? Could you retire early? Only you know the answers to the questions. Is getting completely out of debt worth it enough to live those answers? For me, hell yeah!